As summer is in full swing, so are the bathing suits, the shorts, the cute little tank tops. Getting fit just for the summer should be something that you tune into year-round though. My Tone It Up journey is not one of great weight loss, but it is one of a great awakening to a healthy life. I grew up never having to worry about making an effort to stay fit. I didn't eat much, I was petite to begin with. From age 8 until 18 I was a cheerleader, so my metabolism was high and I didn't worry about eating ice cream late at night. When I graduated high school and entered into college, my metabolism and body took on a new transformation. My freshman year at college was difficult-learning new routines, how to be on my own, a break-up, the death of a grandparent…many contributing factors for me to turn to food as comfort, or simply an after-thought. When you are petite and 4'11" it is easy to see any weight gain. All throughout college, I noticed that my weight would go up and down just by a few pounds, but those few pounds really mattered when there wasn't a lot of body available to distribute it! The week after college graduation, I moved away to start my "big girl job" in a big city as the Art Director for a magazine. I was so excited about starting my life. I didn't keep a strict workout regimen, I didn't make a point to choose a salad rather than pasta. My metabolism was not what it used to be and though I was certainly not fat, I was definitely not fit. After the dream job I landed turned sour and a serious relationship faltered, I was depressed, angry and again let food be my comfort. I did not feel good about myself at all and I knew I needed to change habits of simply not getting up and moving, not caring what I was putting into my body. I really took control of my health when I started a less stressful job, began dating my husband and realized it was time to grow up and get serious about my health. I was not feeling or looking like a perky 20-something and that had to change. I found Tone It Up through seeing tweets from Tenley Molzahn (from The Bachelor) and checking it out. I started doing the workouts and becoming more and more interested in the nutrition plan. I bit the bullet and bought the plan at the end of January 2011. That was when my lifestyle completely changed. I ate vegetables I had never liked, I prepared food in healthy ways and I finally learned to love to cook. I lost and toned ten pounds and loved how my body was changing and most importantly, how I was feeling. I tried a Barre Amped class and fell in love with barre workouts the following fall. I paired those workouts with my Tone It Up workouts, constantly being encouraged by Karena and Katrina to push harder, be better and love myself more. I found so much joy through simply doing what I knew I had to do. Having the most positive, sunny trainers ever helped me push over those plateaus. I got engaged in June 2012 and stuck to my Tone It Up plan, my workouts with Karena and Katrina and Barre Amped. On my wedding day, I felt toned and beautiful. I was glowing from happiness and health. When we returned from our honeymoon, I went back to my barre class and found out that a new studio was opening and new instructors were needed. I jumped on the opportunity to encourage others to take hold of their health and love to workout just like Karena and Katrina have done for me. I got certified December 2012 and have been teaching since. I continue to watch my body tone and change. I crave healthy food and the thrill of an amazing workout now. It's amazing how you can teach your body to feel that way. Yes, you can still indulge in sweet treats, burgers, pastas…but in moderation it makes you appreciate it more and also realize why you chose a healthier path. 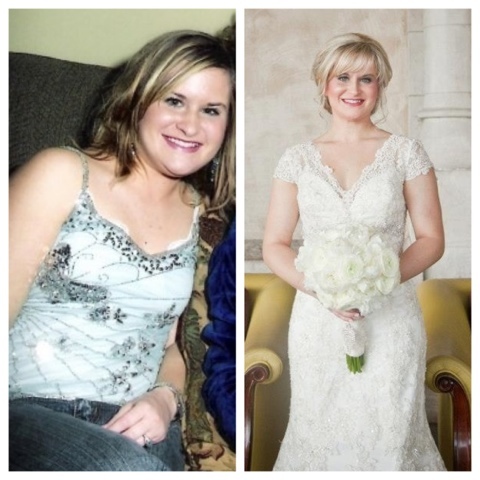 Here is my before and after: my freshman year of college at a sorority party and on my wedding day, when I felt great.